How do you begin a cookbook review for a book targeted to kids? No, not mussels. I do mean muscles. Twenty years ago, working with kids in the kitchen required some care. Giving them a knife was perhaps risky. Attention and attention span could be problematic. Kids were awkward in their movement and particularly with their hands. It has all changed. Kids today grow up on tablets and phones. They have hundreds, if not thousands, of hours of “nimble” time. Their muscle control is excellent. Their ability to focus is strong. Their capacity to rise to a challenge is almost terrifying. Kids are different. Different in a good way. Different in ways that make it easier for them to be in the kitchen and cook with you. Or without you, just on their own. Mardi Michels grew up in Australia, moved to Paris, and now lives in Canada teaching, what else, French. She loves French culture, the language, and the food. So, how does she approach recipes and techniques for kids? In the recipes listed for Breakfast, there is an entry for Quick Croissants. Golly, I wondered. What does “quick” mean? Is she going to cut corners? A real croissant is made with laminated dough, it’s a two-day process and there are twenty steps. What is her recipe going to be like? I looked, I read, I sighed in happy relief. It’s not that quick, but it is very realistic. There are 19 steps, an hour and forty-five minutes of active time, hours of chilling [if not overnight so that two-day template is followed], and three hours of proofing before a short baking time. 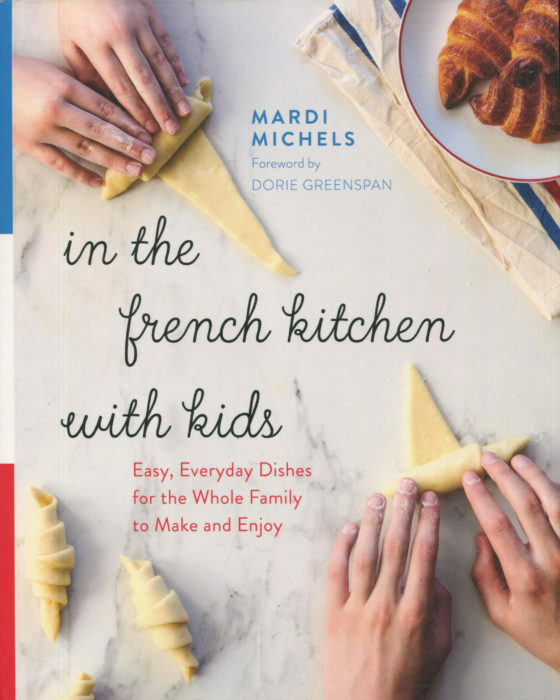 In short, Mardi is going to teach your kids how to make an honest, authentic, wonderful croissant. And, to boot, in her side note, she explains why in France some croissants are straight-shaped and some curved. [Hint, some people cheat and don’t make their croissants with butter!]. Those side notes are sprinkled through the book and provide lively flavor. And education. Breakfast is fast and healthy: No-Knead French Loaf, those Quick Croissants [started the day before], Breakfast Rolls, Creamy Yogurt Pots, Omelets, and Individual Baked Eggs. Lunch is very French: Creamy Vegetable Soup; Grilled Ham and Cheese [aka Croque-Monsieur]; Bacon, Cheese and Onion Quiche; Cheesy Pasta Bake with Ham; Stuffed Baked Tomatoes; and a trio of salads [Grated Carrot, Creamy Celery Root, and Couscous]. I will tell you that at Jennings Lodge Elementary School outside Portland, Oregon, I never had any of that. Not a forkful. Now, I did grow up in the 50’s when my after-school snacks were Oreos. Or more Oreos. Here After-School means: Pains au Chocolate, Madeleines, Financiers, Yogurt Cake, French Pound Cake, Mini Jam Tarts, Butter Cookies, and Traditional Macaroons. Just so you know, as I am writing this, at this point I officially feel deprived. Dinner ideas include: Shepard’s Pie, Pork Chops with Apples, Crunch Fish Cakes, and Cheesey Scalloped Potatoes. The ideas here are ones you would find at your corner bistro in Paris. But, but, these dishes are ones you can prepare at home. No, your kids prepare at home while you stand watchand . And perhaps stand and sip. Dessert ends the meal on a high note that will have your kids feeling like culinary champions. How could they not? They’ve made one of these: Coeur a la Crème with Raspberry Coulis, Mixed Berry Galettes, Crème Caramel, or Eclairs. There are other dessert ideas there. If you put this book in their hands, your kids will gravitate to this chapter. Charming, powerful, and educational. You, too, will want to be In the French Kitchen with Kids. Your kids. Oh, no kids yet? Or anymore? Gee, I think you’ll find the book quite lovely for yourself! We are all kids at heart. Look at that After-School snacks chapter. Oh my goodness – thank you so very much for this delightful review. You completely “get” the book and who it’s targeted at (yes, kids, but really, everyone!). I’m so glad you enjoyed the stories and lessons throughout and that the book makes you feel hungry and like cooking with (or without) kids. Mission accomplished! My pleasure. I look forward to your next book!